Winter, 1865: the final stages of General Sherman’s bloody march through the South. On February 17th, the capitol city of Columbia, South Carolina lay squarely in the General’s crosshairs. 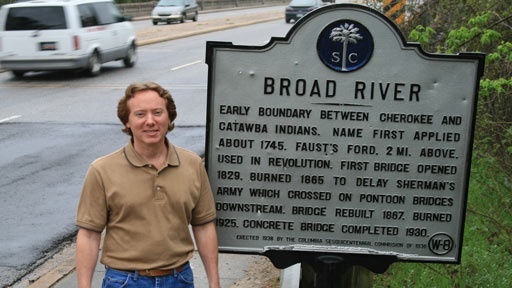 In a last-ditch effort to protect the vital railroad hub and the thousands of terrified refugees packing city streets, Confederate soldiers destroyed the remaining bridge over the Broad River. The reprieve was temporary. In less than 12 hours Sherman’s men crossed the river and brought destruction to the birthplace of the Secessionist South. Nearly a century and a half after these dramatic events, David Brinkman of Columbia, South Carolina, believes a longstanding marker commemorating this history has missed the mark. History Detectives host Elyse Luray goes to Columbia to examine the evidence and see if this discovery could redraw the maps of the Civil War. Also in Civil War: 1850-1877 Whaling Ship Might a ship docked in Mystic Seaport, hold secrets to the Underground Railroad? Also with Elyse Luray Amelia Earhart Plane Was this piece of metal ripped from one of the most famous missing planes in history? Related Investigation Civil War Balloon Could this piece of frayed material be from the country's first military airship? Also with Elyse Luray Drone Propellor Could this propellor have powered a top secret weapon that transformed modern warfare?